The Big Picture: The soothing vista of an endless horizon makes a breathtaking backdrop for this Sullivan’s retreat. 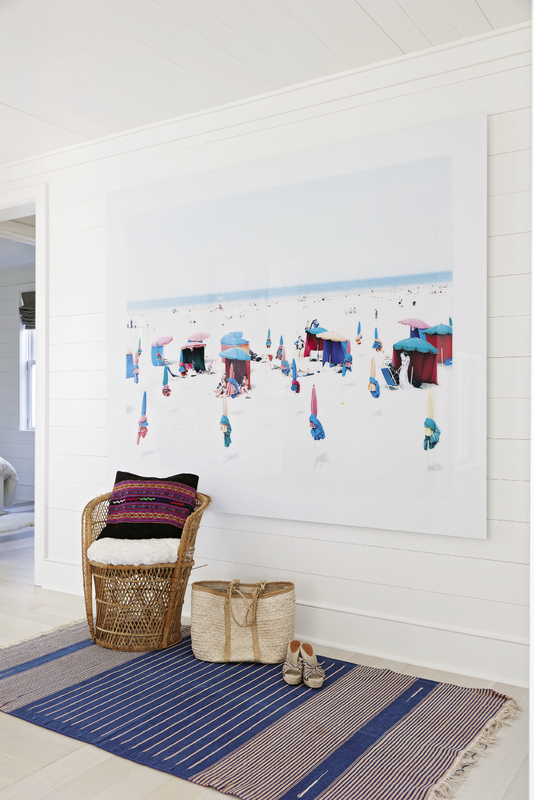 White shiplap walls give a classic old beach-house feel while showcasing primo contemporary art, like this surfer painting by Isca Greenfield Sanders. The handcrafted teak outdoor dining table by Brian Hall of Kistler Design Co. echoes the home’s clean lines. 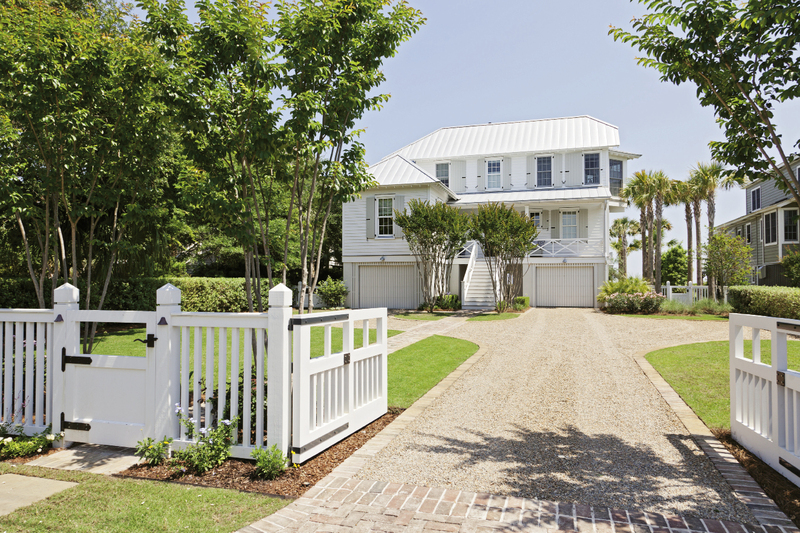 Double Take: Architect Beau Clowney, working with builders Daly & Sawyer, gave the street side of the house a smaller scale, in keeping with old Sullivan’s charm, while the beachfront façade is a classic, porch-perfect beach house. Lights Up: Interior designer Jenny Keenan refashioned two old gymnasium lights, hung by a whipped rope cord, as kitchen pendants. Furniture maker Brian Hall searched high and low for the perfect cypress stump to anchor the dining table. Furniture maker Brian Hall also made the teak porch sectional. 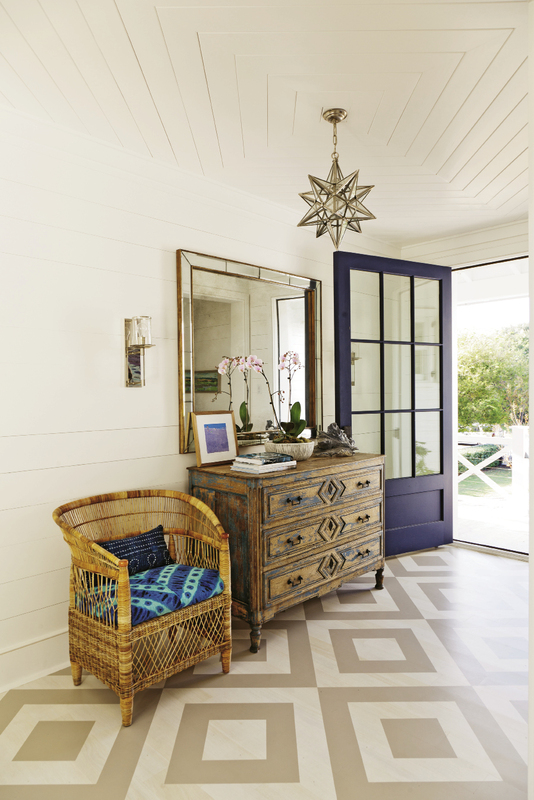 Surfs Up: A painted foyer floor helps “gives an unexpected punch, leading upstairs,” says Keenan. 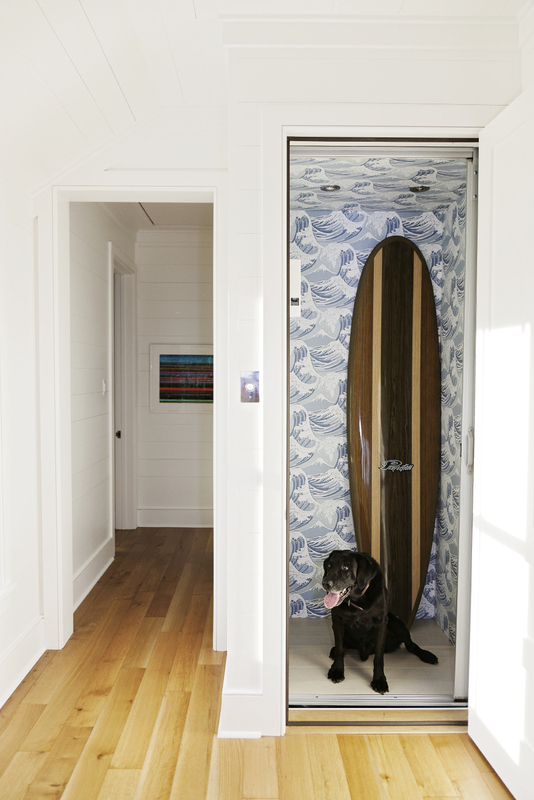 A wallpapered elevator is available for tired surfers. 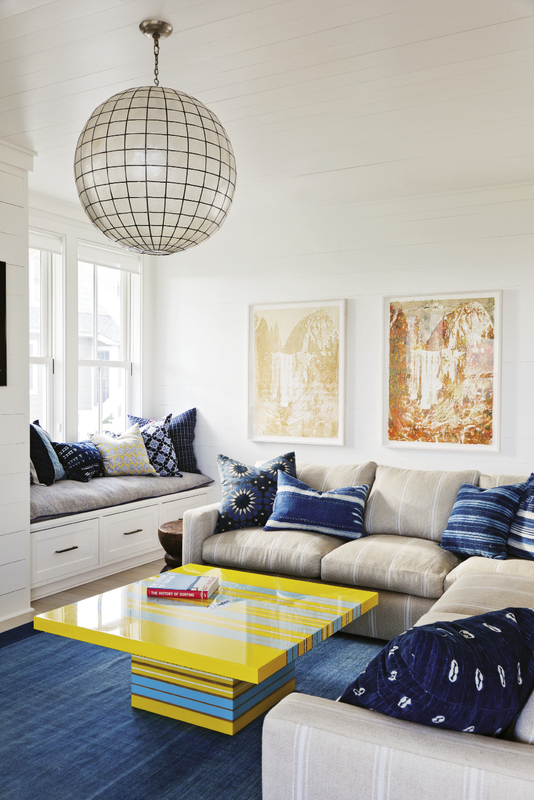 The family room hangs 10 with a bright yellow and blue surfboard-inspired table and an array of pillows made from vintage textiles. Delicious artwork by Matthew Brandt is made of Gummi Bears and Pixy Stixs. A wall-size panorama by Italian photographer Massimo Vitali makes for captivating beach viewing inside and out. 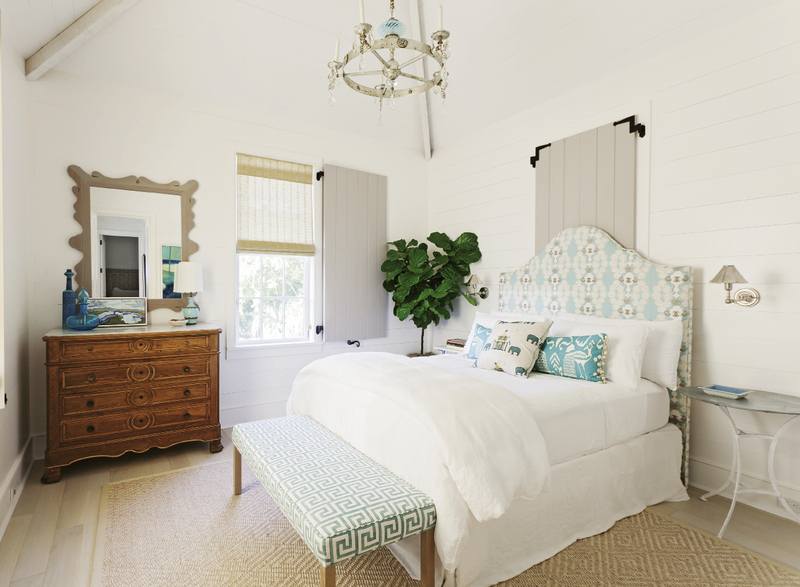 Beach Dreams: A guest bedroom, outfitted with dreamy creams and blues, proves that comfort and class can come in smaller sizes. 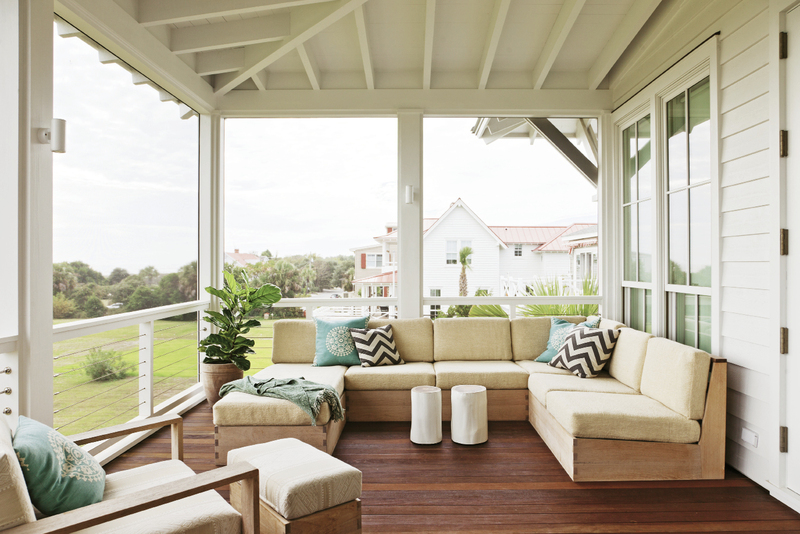 The “hyphen” that connects the street-side wing with the beachfront part of the house also functions as an inviting sitting/reading area. Clowney’s beak window in the master (with ceiling faux-painted like driftwood) expands the ocean view from the rear of the house. Down Under: The breezy plein-air living room under the house includes an outdoor fireplace and bar, with plenty of room for entertaining or just lounging in the shade. Hectic, fast-paced, chaotic, high stress—this is life in New York City, even amidst all its rich cultural offerings. Add two young kids to the mix and Manhattan can be a lively jumble of fabulous opportunity and frustrating obstacles. But slip away to where the day’s schedule is ruled by the tides, where beach cruisers replace taxi cabs, and where sand between the toes displaces urban grit, and the lure of a seaside Sullivan’s idyll becomes obvious enough. So it is for a young New York City couple who has created an easy-living, high-style beach retreat for their family. 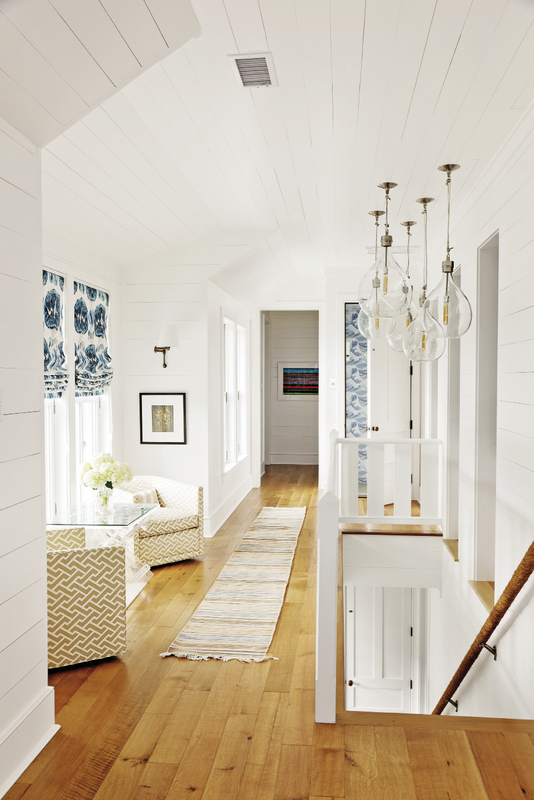 “We wanted it to look and feel like a quintessential Sullivan’s Island beach house,” says the owner, a Virginia native and Clemson grad who lived in Charleston (and loved Sullivan’s) for four years before she moved to Manhattan. The front-beach lot, thought to be the site of an old hotel, is almost a geographical center point of the island, with spectacular views both up and down the beach. 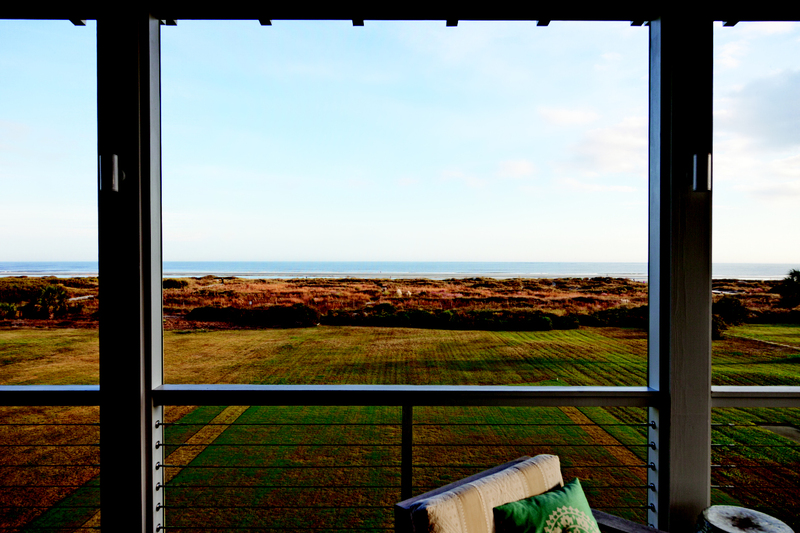 Looking out from the home’s second-floor porch, the wide green lawns juxtaposed against an endless ribbon of sand and the expansive vista of the Atlantic evoke a deep, contented sigh. “It’s such an incredible view, so peaceful and rejuvenating, the perfect contrast to the city skyline,” says the busy young urban mom. 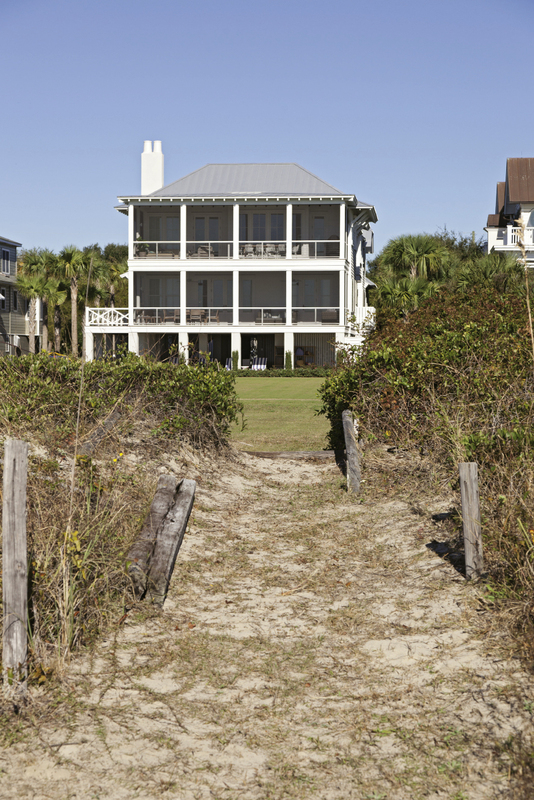 “This house is all about the setting,” notes the owner, who enlisted architect Beau Clowney to capitalize on the “huge horizon of both sky and water” while designing a “new home that felt old,” a home that carried forth some of the classic elements of the old island bungalows, many of which were lost or damaged in Hurricane Hugo and are now replaced by sprawling new construction. “Casual and comfortable was what we wanted,” she says. “Not a fancy house, but one that was really beautiful and a fun place to be.” The other stipulation was that the home be spacious enough to host guests but cozy enough to keep the family connected when the four of them were there solo. 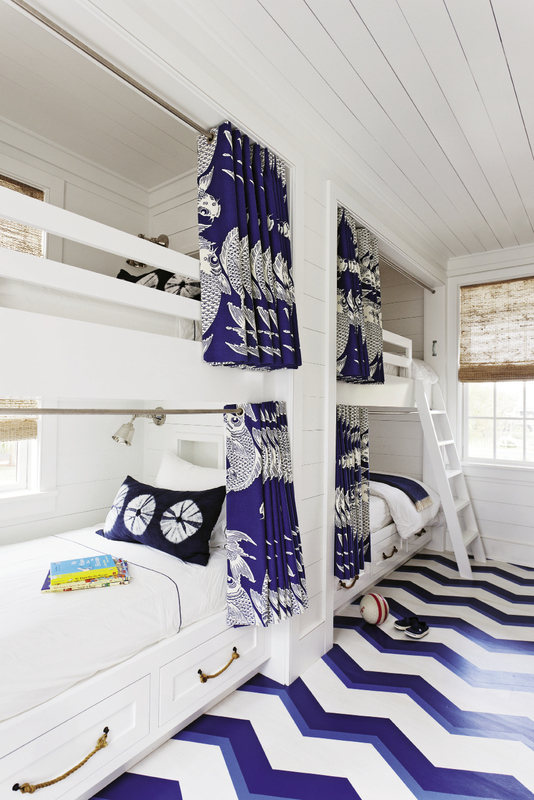 For their beach oasis, the family wanted a flipped house, or inverted floor plan. “Actually my husband wanted it inverted to make the most of the scenery; I was skeptical at first,” the wife says, though now she confesses she loves the great porches and breezes the layout affords, in addition to the killer view. The guest bedrooms, including a cozy bunk room that sleeps four, are on the first floor, and the family living areas are on the second floor, with the master bedroom and the boys’ twin bedroom on the street-facing side of the house. “The boys are still young [ages six and three], so Mom and Dad wanted to function as a small family unit in that section of the house,” says Clowney. 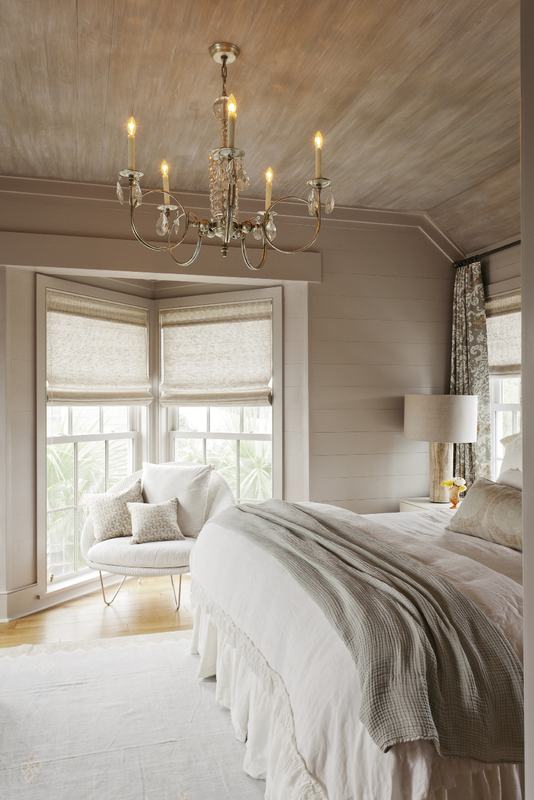 But even though their bedrooms aren’t facing the beach, he ensured they had glimpses of the water. 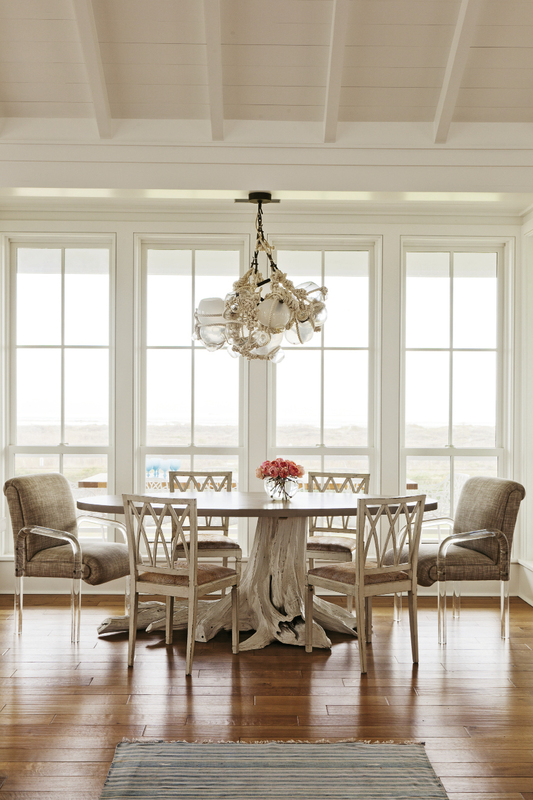 In the master, the architect added a triangular bay window, or “beak” (a Victorian detail said to be unique to the island and that he once photographed on an old Sullivan’s home) that expands the room’s ocean view. While there are ample beds and bedrooms, they are modest, even small, in size. “The owners wanted their family time and time with guests to be spent outside, enjoying the beach, so large rooms weren’t necessary,” Clowney notes. Windows and porches abound. “We love our porches. The transition between inside and out is so subtle,” the owner says. 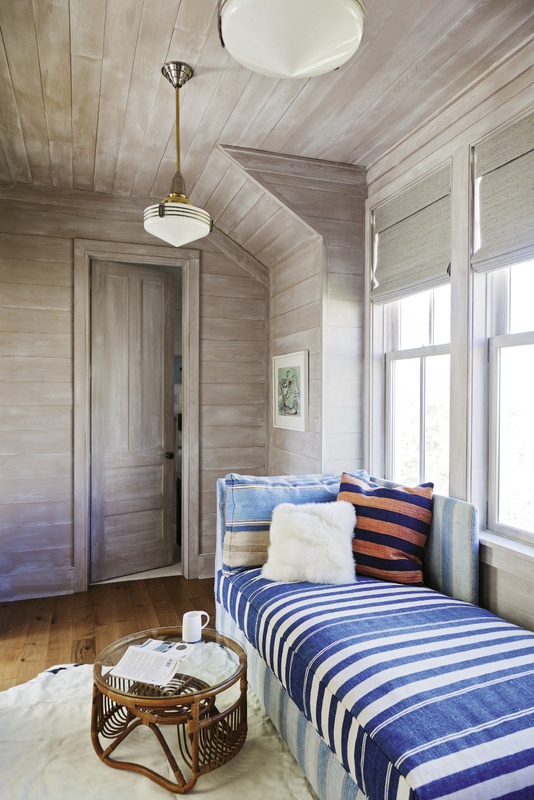 “It’s so easy to be outside, which is the whole point.” Interior designer Jenny Keenan worked with Clowney from the early stages to coordinate finishes, lighting (mostly refurbished vintage glass and metal, custom-made by a Raleigh, North Carolina, artisan), and built-ins. She also oversaw the endless details, such as making sure the window seats in the den had ample storage for the boys’ toys and that the vintage wooden doorknobs rescued from an obscure architectural salvage warehouse could be made functional (trickier than you’d imagine). “All these little touches—the classic bathroom tile patterns, the repurposed fixtures—make the house ‘live’ old. People always ask when it was renovated, not realizing it’s new construction,” says Keenan. “Jenny is the real deal—and she’s a wonderful collaborator. It’s all definitely her work, but it really reflects who our family is,” says the owner. Though she is admittedly “not comfortable with color,” Keenan won her trust and “broadened my horizons,” she adds. Case in point: a bright yellow coffee table steals the show in the family room. The table—custom-crafted in the style and material of a vintage surfboard—is a work of functional art. Elsewhere, calming cool blues in various patterns from old dhurries brighten the oak floors, and vintage indigo textiles add punch to a mishmash of pillows on the comfy oversize sofas. 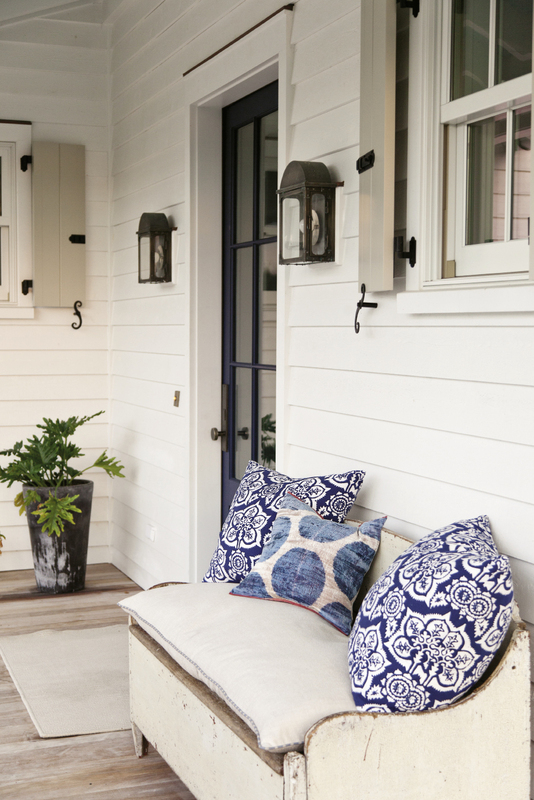 “This house is all about the setting and bringing in the sunshine, and Jenny definitely used white with pops of color and great lighting fixtures to make the most of that,” the owner says. “It was fun to work with a great young couple with such a fresh view on everything,” says Clowney. “They wanted a beachy feel but clean lines. And they really wanted to showcase their art.” Keenan, along with the owner’s cousin (a professional art advisor), was instrumental here, pointing them to unique local pieces, such as works by the late Don ZanFagna and Charleston Artist Collective members Ann Keane and Lynne Hamontree. A wall-size panorama by Italian photographer Massimo Vitali anchors the first-floor hallway. 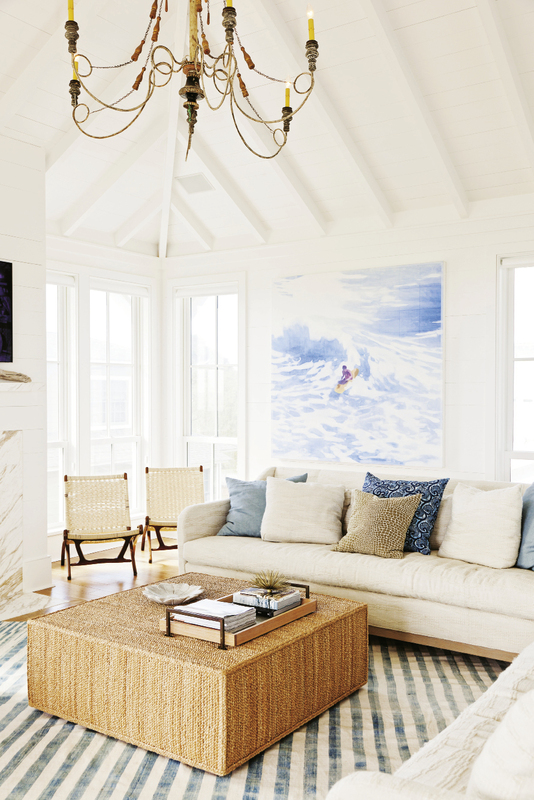 Throughout the home, shiplap walls doused in Farrow & Ball’s “All White” imbue an old beach house ambiance while creating the perfect backdrop for art. 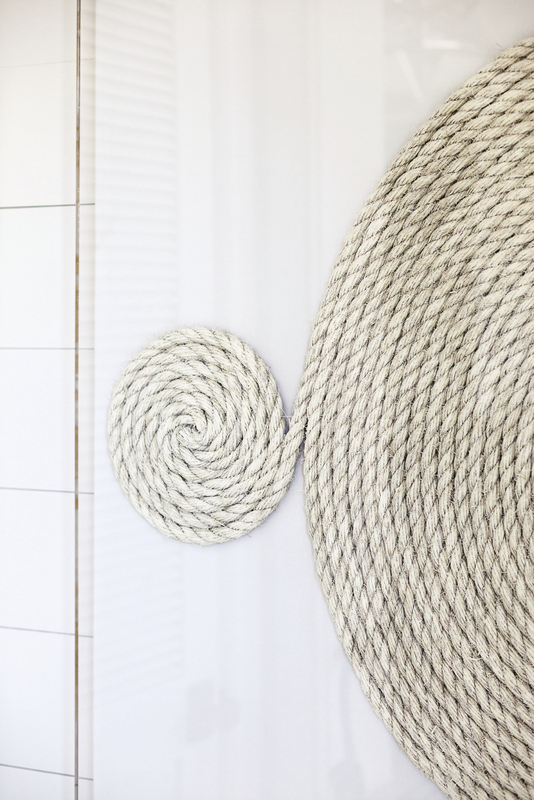 But some of the home’s artful details are not on ready display. In fact they are closeted. 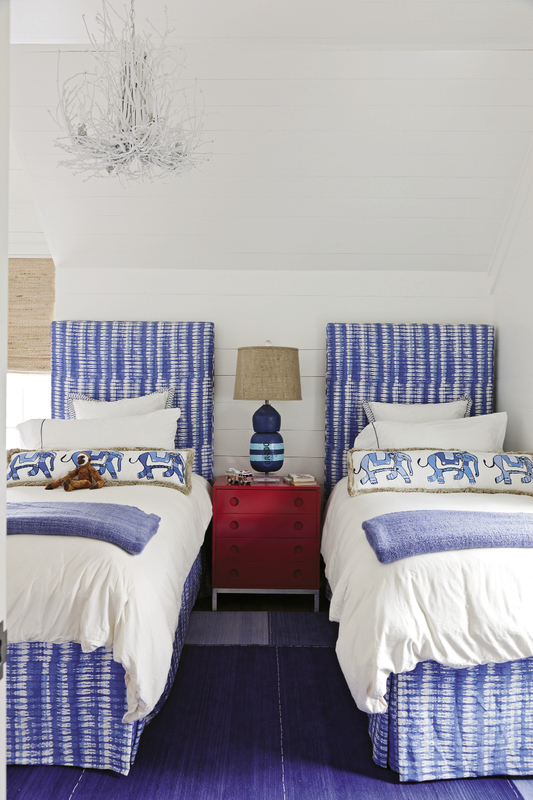 A quick peek-a-boo in each bedroom closet reveals beautiful wallpaper, ranging from classic designs circa-grandma’s house to swanky mod graphics. No corner in the house is left undressed, but in keeping with the owner’s no-fuss style, nothing feels forced or overdone. This holds true down to the ground level. 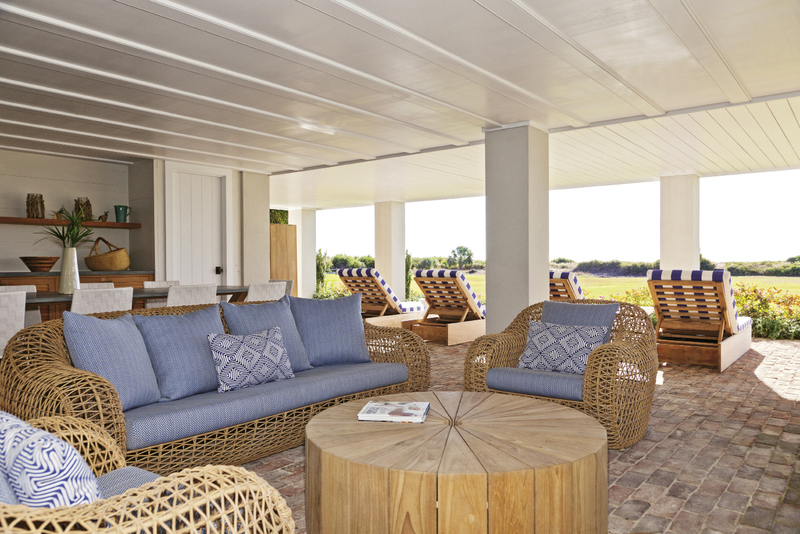 Finished with a brick floor and teak furniture custom-made by local craftsman Brian Hall of Kistler Design Co., the “underbelly of the house,” as Clowney calls it, is an open-air respite from the heat and sun. “There’s always a wonderful breeze down there. It’s a great entertaining area,” he says. 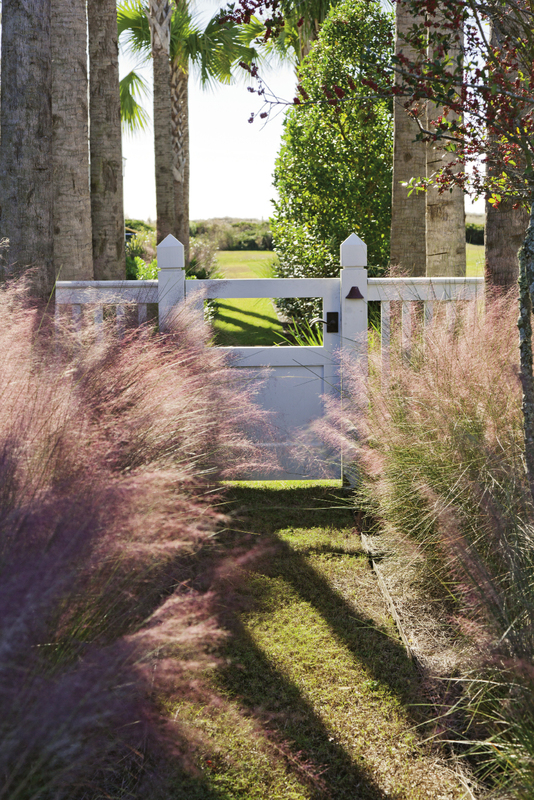 Sheila Wertimer’s understated landscaping, including a bluestone courtyard with a centerpiece olive tree, adds texture and bits of color without detracting from the real outside draw—the beach. But, for the time being, their island abode, with ample room for visitors to plop on a bunk or hang out on a porch and plenty of relaxed, easy-living space for family time, is an ideal home-away-from-home, the one with no worries, no cares, and a little more color than usual.